If you’ve ever spent time digging through your purse, wallet or coat pockets for your debit card while an impatient crowd lines up behind you, Bank of America’s cardless ATM machines might be for you. Bank of America, Wells Fargo and JPMorgan Chase all debuted cardless ATM technology in early 2016. So, far more than half of Charlotte, N.C.-based Bank of America’s network of roughly 16,000 ATMs has been upgraded to conduct cardless transactions, says Victor K. Branch, Bank of America’s Richmond region market president. “It’s the wave of the future, but at the same time traditional brick-and-mortar banking will be there as well, to give customers options and alternatives to interface with our banks,” says Branch, noting that other innovations on the way include a Spanish-language version of the bank’s mobile banking app. 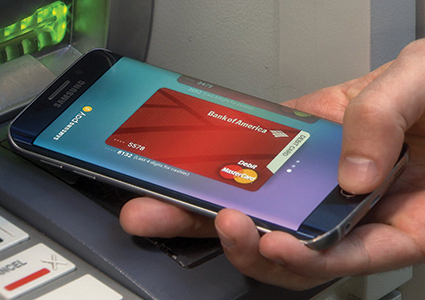 Digital wallet apps are enabled by a technology known as near-field communication, or NFC. It enables wireless, secure data transfers without an internet connection between compatible devices that are in close proximity to each other. Equipped with NFC microchips, the devices communicate by high-frequency radio waves. Cardless ATM technology is billed as a more secure way of conducting transactions because it defeats card readers and other methods of stealing debit card numbers and PINs. And there’s also this fact that in our selfie-crazed society: “I think people are more guarded about their phone than some of their debit cards and credit cards,” Branch says.